Building a house is stressful. Building a skyscraper is a nuclear bomb of stress, problems, and carefully-coordinated chaos—chaos that is closely tied to the economy, and that is easily derailed by war, politics, and financial downturns. It's not an uncommon story. There are plenty of super-tall (over 984 feet) buildings that were proposed but never made it through to reality. Humans have a tendency towards bombast when it comes to skyscrapers. But recently, the Council on Tall Buildings and Urban Habitat looked at a unique subset of these failed projects that are especially interesting: Super-tall buildings that actually did begin construction, but were never completed. Below you'll find a few of the buildings that, as proposed, would have become the world's tallest (or close to it). Keep in mind, there are plenty of other stalled or on-hold projects out there—CTBUH defines unfinished as "when site works had begun, but were completely halted, and no reports indicate that construction will continue." You can check out CTBUH's full study in PDF form here. Nowhere was the 2008 financial crisis quite as visible as Dubai, where dozens of high-profile projects ground to a halt. One of those was Nakheel Tower, a proposed 3,300-foot-tall skyscraper with 156 planned elevators. Nakheel was designed to be the visual and economic focal point of the man-made Palm Jumeirah, the fake series of islands off of Dubai that is now experiencing extreme erosion and other environmental problems. India Tower, on the other hand, was a purely post-Recession idea. The 2,356-foot tower was planned for Mumbai in 2010, but was halted the following year after construction had begun. It's currently on hold. Yet another victim of the 2008 crisis: The 2,008-foot Russia Tower was already under construction when the downturn hit the following year, and the building's developer announced he'd be unable to put up the $3 billion needed for the building work. The construction site was turned into parking. At 1,808 feet, this tower in Doha was destined to become one of the world's tallest buildings. Just one problem: It was so tall, officials worried it would make it tough for pilots landing and taking off from the new airport. Construction was halted until Doha'sn new airport was finished... Until the project was abruptly cancelled anyways. Again, Dubai makes many appearances on this list. The city's real estate boom was growing exponentially leading up to 2008, and dramatic and expressive towers like this one were en vogue. Burj Al Alam was a flower-shaped tower proposed to rise 1,670-feet into the air—it was cancelled in 2013 after a long, slow, much-denied decline. The Palace of the Soviets was to be antithesis of the aristocratic Russia—a people's palace built on the ruins of a demolished church where delegates from the newly-formed Soviet Republic could meet. 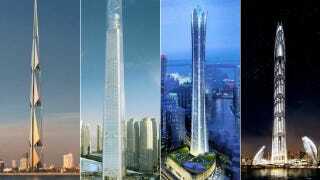 It would be enormous: At 1,624 feet, by far the tallest building in the world. It actually made it to construction, extraordinarily, but was halted by the onset of World War II. The circular foundation was eventually turned into the Moskva Pool—the world's largest for decades.